HONOLULU (AP) — A stream of lava set a home on fire Monday in a rural Hawaii town that has been watching the slow-moving flow approach for months. The molten rock hit the house just before noon, said Hawaii County Civil Defence Director Darryl Oliveira. The home’s renters already had left the residence in Pahoa, the largest town in Big Island’s isolated and mostly agricultural Puna district. It could take 30 to 40 minutes for the home to burn down, Oliveira said. 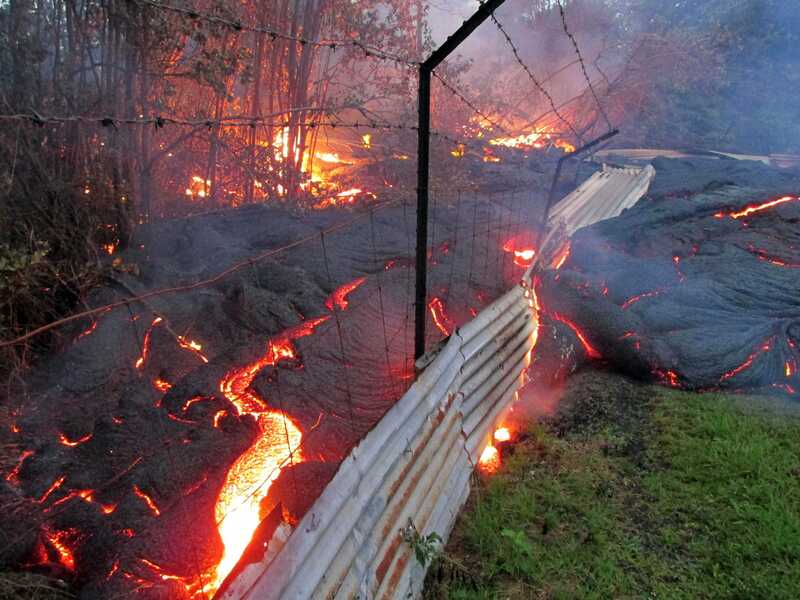 Earlier in the day, lava burned down a small corrugated steel storage shed on the property, he said. The lava from Kilauea volcano emerged from a vent in June and entered Pahoa Oct. 26, when it crossed a country road at the edge of town. Since then, it has smothered part of a cemetery and burned down a garden shed. It also burned tires, some metal materials and mostly vegetation in its path. Firefighters will basically let a structure burn, but they will fight any wildfires that spread or threaten other structures, Oliveira said. A relative of the home’s owners, who live on the mainland, was planning to be at the site to watch the house burn, Oliveira said. That family member was driving from another part of the island about two hours away and it wasn’t clear if he reached Pahoa in time. Oliveira said officials would make arrangements for homeowners to watch any homes burn as a means of closure and to document the destruction for insurance purposes. The leading edge of the molten rock had stalled Oct. 30, but lava was breaking away at several spots upslope. The leading edge remained about 480 feet from Pahoa Village Road, the main street that goes through downtown. Crews have been working on alternate routes to be used when lava hits Highway 130, considered a lifeline for the Puna district. Many residents have evacuated or are ready to leave if necessary. Imelda Raras lives on the other end of Apaa Street from where the lava burned its first house. She and her family have put a lot of their belongings in storage and prepared to go to a friend’s home if the lava gets close. The homeowner of the house that was burning had arranged weeks ago to relocate horses and other animals, Raras said.